The girls were clearly uneasy and displayed it in the most bizarre way. They were rude, they talked over the therapist, they blanked him, they laughed in a garish manner, they played loudly, they acted oddly, they were seriously hyped. It was a peculiar situation so it was to be expected, still, it was very bizarre and unsettling to watch. What made it worse I felt, was my unprepared state. I didn’t know if I should correct the girls for their rude behaviour and calm them or just leave them to it. I didn’t know what I was supposed to say or if I was supposed to be discreet in front of the girls or just speak openly, when the girls answered the therapists questions incorrectly, should I have prompted them with the right answer? The next appointment is in 3 weeks time which is much longer than the weekly appointments I had originally thought were taking place. I know it was only the first appointment but I’m not sure how this is supposed to help them?! I dont think im going to like these sessions very much, I feel emotionally drained and I’m not even the one in therapy, am I? We have our first therapy session at CAMHS today, just me and my girls, to say im nervous would be an understatement. What to expect of the session? How will the girls react? Will the girls let the therapist see the real them? Splish Splash the girls playing in the bath! Ooops Im more wet than the girls! Was worth it though, we all laughed a lot, except Daddy that is, who was not impressed at the wet floor! Laughters something that seems to be getting harder and harder to find of late, must try harder. Following on from my last blog, sleep is important because if they don’t get enough we have days/weeks like this. My baby girl came out of school for the 3rd consecutive day beaming and excited to tell me she hadn’t eaten her lunch. I’ve already reduced her lunch box contents months ago as she was taking up to 40minutes some days the school told me. Wednesday’s lunch a sandwich and bag of apple slices, the line was said with a huge grin as she ran out of school to me ‘Mommy I didn’t eat my sandwich today because I dropped it so it had to go in the bin’. I spoke to the teacher who told me it seemed she’s accidentally dropped her sandwich today. My thoughts ‘Hmm’. Thursdays lunch a sandwich and 2 mini sausages, the line, again beaming from ear to ear ‘Mommy I didn’t eat my sandwich today because my teacher said there wasnt time’. Once again, asked the teacher who said they’d left my baby girl for the entire 1hr lunch break to eat her lunch because she told them ‘mommy says I have to eat it’ so they thought they’d give her a chance as she seemed worried!? I told them, ‘no more than 30 minutes, she’ll not starve, she’s playing a game and your her pawns’. I told my baby girl ‘Its a shame you didn’t eat your dinner today because as a surprise mommy had brought chocolate for you all for the walk home but you wont be able to have any as you didn’t eat your lunch. My thoughts ‘Hmmmm’. Fridays lunch a sandwich, the line said whilst positively beaming ‘Mommy I didn’t eat my lunch today because my teacher didn’t give me enough time’. My reply ‘Oh dear well if you havent eaten your lunch then you wont have any energy to go to your swimming lesson tonight, never mind. My thoughts ‘Hmmmm & Ha!’. She’s tired, it’s always worse when she’s tired! Then there’s my big girl who came out of school today with a big smile and more lies…………….’she was in trouble at school today’……………’She wasnt in trouble’……………….’She forgot what she did’……………………..’She didnt do anything’………………’She cant remember if she was in trouble’………………’the teacher doesn’t know’………………..’She didnt get in to trouble’……… From what I have gathered once we got home, she told tales to the teacher about a boy on her table, her teacher replied with ‘I dont want to hear it’. Who knows how accurate that is though, it could have just been more lies its difficult to know. She’s tired, is this the reason for all the lies lately or is there something else!? I’m tired of feeling annoyed with them all the time, it certainly isn’t doing much to aid bonding! Maybe they’ll give up pushing soon……………………………………….or maybe they wont! When did sleep become such an important factor!? My big girl doesn’t sleep well at all and struggles to function on a daily basis from lack of sleep, she’s often pale, has no energy, no attention span, dark circles under her eyes and tells me her muscles ache. She has her own room, sharing would provide too many distractions and temptations to keep her awake. My baby girl needs lots of sleep, without it she’s unbearable to be around, she shares with my middle girl whom she’s very competitive with. This results in fidget contests, cough contests, sigh contests, sniff contests, the list is endless, they’re in bunk beds so can’t see one another, they don’t chatter either, but they communicate their competitiveness perfectly well with noise/motion. My baby girls behaviour would be so much better if she had her own room and was able to sleep as much as she needed to. My middle girl sleeps relatively well and her behaviour when she’s tired is manageable/normal! I hate that their sleep habits have such a huge impact on our family life! Well the last week or so has been a reminder. My girls (especially my big girl) are traumatised. I always feel a little surprised with a bit of disbelief when people talk to me about my girls and imply they’re fine now that they have us, arent they!? If the neglect and trauma wasnt enough to damage their little hearts and teach them that chaos and danger are what you get in life and trust and love is something they’re not worthy of, then maybe being dragged away from everything they ever cared about, family, friends, teachers, familiar faces, places they knew, toys, clothes and even smells that were familiar would be enough for people to understand why my girls have issues. It seems not, they’re expected to ‘be fine’ because now they have a new mummy and daddy and a new home and they’re safe and loved so none of that matters any more does it, it’s all in the past, they’ve forgotten everything and are just like any other child that’s in a loving family arent they. Yeah right! Sometimes I forget why my girls do some of the things they do, I forget that poor behaviour is a cry for help, crys for me to prove that I’ll love them no matter what and that they can trust me, even when I can’t trust them! When im hurting inside its hard to remember that they’re hurting more. Sometimes I need reminding. Being an adoptive mom pushes you to the outer limits and then beyond. 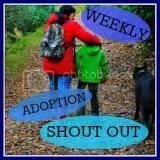 Being an adoptive mom is really hard!